This page is designed to help you get around on the island of Kauai. We have included links to our favorite publications, places to go, and things to do. 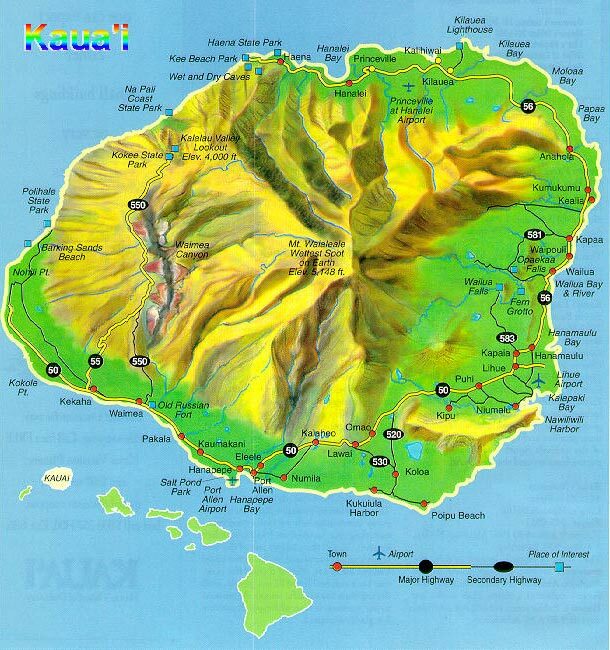 This is a nice map of the island of Kauai with major towns and roads. It also gives you an idea of the topography. This is a great tourist magazine that contains coupons, maps, restaurant guides, and more. We think the most important thing about this magazine is that the 101 things that they list are really great. We have done many of them and can vouch for them. You can use this guide to help you plan your activities. The Garden Island newspaper has the weather and lots of information about local current events. We think this is one of the best books on what to do and where to go in Kauai. Check it out for some great insights and good histories. There is a good ranking of the restaurants broken out by location. We especially like the writeups on the different beaches. Contact them for a brochure! This is a nice brochure with specifics about beaches, activities, accommodations, and dining in our immediate area of Poipu Beach. Just about everything you will want to know about the weather. Maybe you can check out the forcast before your flight! A great site with information about Kauai parks and recreation. They have information about parks where camping is permitted along with fees, and public facilities for golf and tennis. For more details about Kauai parks, see Division of State Parks for a description of the major Kauai parks. This is a must! You have to make a reservation to tour the Allerton Garden but it is worth the trouble. It is just down the road from our condo at Prince Kuhio Resort. You will recognize many of the sites from the Jurazic Park movie! Visit this site to see the list of Sierra Club sponsored Kauai hikes and outings. They range from easy to difficult and are always beautiful hikes with volunteer guides.